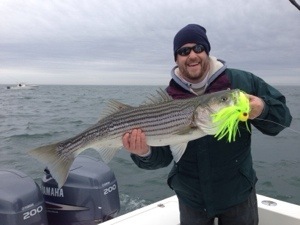 11/23 (Saturday) I ran out on the “Harbor Tails” in search of stripers on the troll again after yesterday’s great bite. We got there early to get in on the action right away, but struggled a bit early having bites not connect and fish pull off. It was a frustrating day to say the least. The 20-25 knot NW wind and boats jockeying for position made it very interesting… We wound up putting one in the box and releasing one before trying for tog, but due to boat complications we had to cut the trip short. It was just one of those days unfortunately. Umbrella Rigs again accounted for the majority of the action for the top boats. 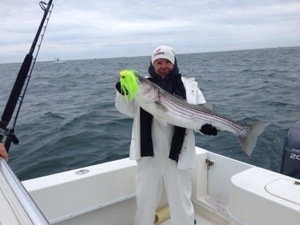 11/22 (Friday) We ran south out of GE Inlet on the “Trade In” searching for some stripers on the troll. We got a late jump, but still managed to get into the troll bite on stripers. We were line class fishing so all I could really pull were Mojo Jigs and Stretch Plugs as they are IGFA legal. Chartruese Mojos accounted for all of our stripers, but the guys pulling Niner Rigs (or some variation of an umbrella rig) really put a hurting on the stripers. We went tog fishing for a bit mid day and caught a lot of throwbacks, but did manage to put 9 keepers in the box. We gave it another look around 2-3 pm for stripers but the structure we fished in the morning looked lifeless.